DETROIT, April 4, 2017 – Röchling Automotive, a leading global provider of integrated system solutions in the areas of aerodynamics, powertrain, and new mobility, is pleased to announce it was named a 2017 Automotive News PACE Awards finalist for its innovative Central Acoustic Air Manifold. The PACE Awards, recognizing superior innovation, technological advancement, and business performance among automotive suppliers, were presented during a ceremony on April 3 at the Max M. Fisher Music Center in Detroit. No other supplier has been able to collectively meet leakage standards, acoustic performance, and stiffness level requirements of OEMs for central air manifolds, while providing material and process cost optimization. Röchling’s Central Acoustic Air Manifold reduces noise considerably in the vehicle cabin by drastically improving the technical aspects of traditional automotive climate ducts. The lightweight manifold, which is integrated into the vehicle’s central console, allows the air noise at maximum air flow to be improved by 6dB(A), and up to 10dB in certain frequency ranges. The air distribution device is constructed with two sound-absorbing Low Weight Reinforced Thermoplastic (LWRT) shells welded onto an injection molded carrier. Widely known for its use of LWRT in underbody panels, Röchling realized LWRT’s potential as a housing material for the air distribution manifolds. Röchling used its LWRT material, SeeberliteTM, to create a component where stiffness and acoustics were integrated and addressed through the use of a single material. 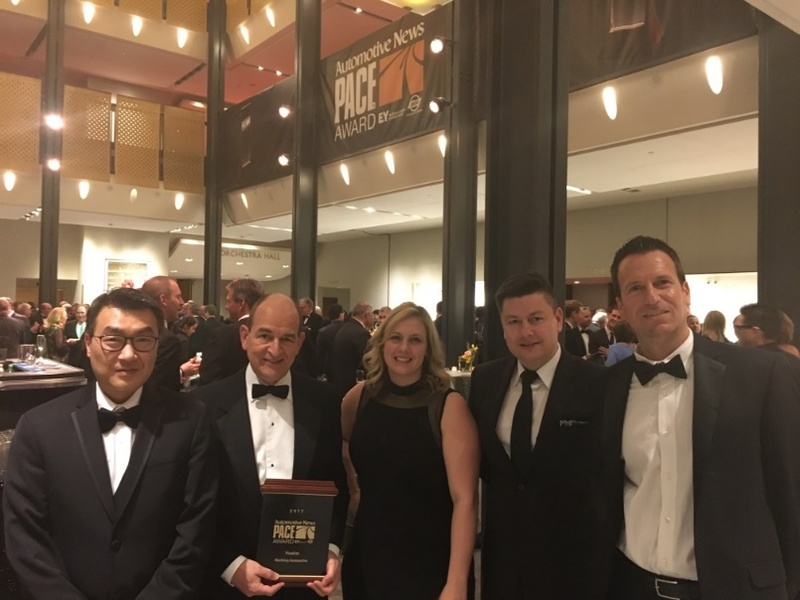 Last year, Röchling was the recipient of an Automotive News PACE Innovation Partnership Award, in conjunction with Audi and FTE Automotive GmbH, for its innovative oil delivery system. Röchling also was named a 2016 PACE award finalist in the product innovation category for the same technology. Röchling team members attended the awards ceremony on April 3rd. From the left; Sang Lee, Erwin Doll, Stephanie Speck, Torsten Rentrop, Jeff Presher.